Soldiers stand near ruined buildings in Washington, D.C. The King assassination riots, also known as the Holy Week Uprising, was a wave of civil disturbance which swept the United States following the assassination of Martin Luther King Jr. on April 4, 1968. They were the greatest wave of social unrest the United States experienced since the Civil War. Some of the biggest riots took place in Washington, D.C., Baltimore, Chicago, and Kansas City. The immediate cause of the rioting was the assassination of Dr. King. Not only was King a beloved leader in the civil rights movement, but also a major advocate for nonviolence. He was a symbol of direct engagement with the political system (as opposed to the separatist ideals of black nationalism). His death led to anger and disillusionment, and feelings that now only violent resistance to white racism could be effective. The rioters were mostly black, but not all were poor. Middle-class blacks also demonstrated against systemic inequality. Although the media called these events “race riots,” there were few confirmed acts of violence between blacks and whites. White businesses tended to be targeted, however, while public and community buildings such as schools and churches were largely spared. In New York City, mayor John Lindsay traveled directly into Harlem, telling black residents that he regretted King's death and was working against poverty. He is credited for averting major riots in New York with this direct response, although minor disturbances still erupted in the city. In Indianapolis, Robert F. Kennedy's speech on the assassination of Martin Luther King Jr. is credited with preventing a riot there. In Boston, rioting may have been averted by a James Brown concert taking place on the night of April 5. In Los Angeles, the Los Angeles Police Department and community activists may have averted rioting in the city. Several memorials were held in tribute to King throughout the Los Angeles area on the days leading into his funeral service. Damage to a Washington store following the riots. The ready availability of jobs in the growing federal government attracted many to Washington in the 1960s, and middle class African-American neighborhoods prospered. Despite the end of legally mandated racial segregation, the historic neighborhoods of Shaw, the H Street Northeast corridor, and Columbia Heights, centered at the intersection of 14th and U Streets Northwest, remained the centers of African-American commercial life in the city. As word of King's murder by James Earl Ray in Memphis spread on the evening of Thursday, April 4, crowds began to gather at 14th and U. Stokely Carmichael led members of the Student Nonviolent Coordinating Committee (SNCC) to stores in the neighborhood demanding that they close out of respect. Although polite at first, the crowd fell out of control and began breaking windows. By 11pm, widespread looting had begun. Mayor-Commissioner Walter Washington ordered the damage cleaned up immediately the next morning. However, anger was still evident on Friday morning when Carmichael addressed a rally at Howard, warning of violence. After the close of the rally, crowds walking down 7th Street NW and in the H Street NE corridor came into violent confrontations with police. By midday, numerous buildings were on fire, and firefighters were prevented from responding by crowds attacking with bottles and rocks. Crowds of as many as 20,000 overwhelmed the District's 3,100-member police force, and President Lyndon B. Johnson dispatched some 13,600 federal troops, including 1,750 federalized [District of Columbia National Guard D.C. National Guard troops, to assist them. Marines mounted machine guns on the steps of the Capitol and Army troops from the 3rd Infantry guarded the White House. At one point, on April 5, rioting reached within two blocks of the White House before rioters retreated. The occupation of Washington was the largest of any American city since the Civil War. Mayor Washington imposed a curfew and banned the sale of alcohol and guns in the city. By the time the city was considered pacified on Sunday, April 8, some 1,200 buildings had been burned, including over 900 stores. Damages reached $27 million. On some blocks, only rubble remained for decades. Columbia Heights and the U Street corridor did not begin to recover economically until the opening of the U Street and Columbia Heights Metro stations in 1991 and 1999, respectively, while the H Street NE corridor remained depressed for several years longer. On April 5, 1968, in Chicago, violence sparked on the West side of the city, and gradually expanded to consume a 28-block stretch of West Madison Street, with additional damage occurring on Roosevelt Road. The Lawndale and Austin neighborhoods on the West Side and the Woodlawn neighborhood on the South Side experienced the majority of the destruction and chaos. The rioters broke windows, looted stores, and set buildings (both abandoned and occupied) on fire. Firefighters quickly flooded the neighborhood, and Chicago's off-duty firefighters were told to report for duty. There were 36 major fires reported between 4:00 pm and 10:00 pm alone. The next day, Mayor Richard J. Daley imposed a curfew on anyone under the age of 21, closed the streets to automobile traffic, and halted the sale of guns or ammunition. Approximately 10,500 police were sent in, and by April 6, more than 6,700 Illinois National Guard troops arrived in Chicago. President Lyndon B. Johnson also sent a total of 5,000 troops from the 1st Armored and 5th Infantry Divisions into the city. The General in charge declared that no one was allowed to have gatherings in the riot areas, and he authorized the use of tear gas. Mayor Richard J. Daley gave police the authority "to shoot to kill any arsonist or anyone with a Molotov cocktail in his hand ... and ... to shoot to maim or cripple anyone looting any stores in our city." The south side ghetto had escaped the major chaos mainly because the two large street gangs, the Blackstone Rangers and the East Side Disciples, cooperated to control their neighborhoods. Many gang members did not participate in the rioting, due in part to King's direct involvement with these groups in 1966. The Baltimore riot of 1968 began two days after the murder. On Saturday, April 6, the Governor of Maryland, Spiro T. Agnew, called out thousands of National Guard troops and 500 Maryland State Police to quell the disturbance. When it was determined that the state forces could not control the riot, Agnew requested Federal troops from President Lyndon B. Johnson. The riot was precipitated by King's assassination, but was also evidence of larger frustrations among the city's African-American population. By Sunday evening, 5,000 paratroopers, combat engineers, and artillerymen from the XVIII Airborne Corps in Fort Bragg, North Carolina, specially trained in tactics, including sniper school, were on the streets of Baltimore with fixed bayonets, and equipped with chemical (CS) disperser backpacks. Two days later, they were joined by a Light Infantry Brigade from Fort Benning, Georgia. With all the police and troops on the streets, the situation began to calm down. The Federal Bureau of Investigation reported that H. Rap Brown was in Baltimore driving a Ford Mustang with Broward County, Florida tags, and was assembling large groups of angry protesters and agitating them to escalate the rioting. In several instances, these disturbances were rapidly quelled through the use of bayonets and chemical dispersers by the XVIII Airborne units. That unit arrested more than 3,000 detainees, who were turned over to the Baltimore Police. A general curfew was set at 6 p.m. in the city limits and martial law was enforced. As rioting continued, African American plainclothes police officers and community leaders were sent to the worst areas to prevent further violence. By the time the riot was over, 6 people were dead, 700 injured, 4,500 arrested and over 1,000 fires set. 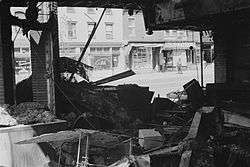 More than a thousand businesses had been looted or burned, many of which never reopened. Total property damage was estimated at $13.5 million. One of the major outcomes of the riot was the attention Governor Agnew received when he criticized local black leaders for not doing enough to help stop the disturbance. While this angered blacks and white liberals, it caught the attention of Republican presidential candidate Richard Nixon, who was looking for someone on his ticket who could counter George Wallace’s American Independent Party campaign. Agnew became Nixon’s vice presidential running mate in 1968. Although not as large as other cities, violent disturbances did erupt in Detroit. Michigan Governor George W. Romney ordered the National Guard into Detroit. One person was killed, and gangs tossed objects at cars and smashed storefront windows along 12th Street on the west side. Rioting erupted in New York the night King was murdered with Harlem, the largest African-American neighborhood in Manhattan, erupting into sporadic violence and looting. Tensions simmered down after Mayor John Lindsay traveled into the heart of the area and stated that he regretted King’s wrongful death which led to the calming of residents although various businesses were still looted and set afire in Harlem and Brooklyn. 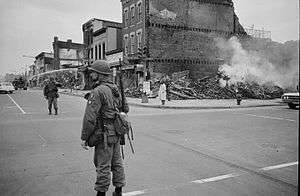 The Trenton Riots of 1968 were a major civil disturbance that took place during the week following the assassination of civil rights leader Martin Luther King in Memphis on April 4. Race riots broke out nationwide following the murder of the civil rights activist. More than 200 Trenton businesses, mostly in Downtown, were ransacked and burned. More than 300 people, most of them young black men, were arrested on charges ranging from assault and arson to looting and violating the mayor's emergency curfew. In addition to 16 injured policemen, 15 firefighters were treated at city hospitals for smoke inhalation, burns, sprains and cuts suffered while fighting raging blazes or for injuries inflicted by rioters. Denizens of Trenton's urban core often pulled false alarms and would then throw bricks at firefighters responding to the alarm boxes. This experience, along with similar experiences in other major cities, effectively ended the use of open-cab fire engines. As an interim measure, the Trenton Fire Department fabricated temporary cab enclosures from steel deck plating until new equipment could be obtained. The losses incurred by downtown businesses were initially estimated by the city to be $7 million, but the total of insurance claims and settlements came to $2.5 million. The two-day riot that occurred after King's assassination was small compared with riots in other cities, but its aftermath – a 9 1⁄2-month occupation by the National Guard – highlighted the depth of Wilmington’s racial problem. During the riot, which occurred on April 9–10, 1968, the mayor asked for a small number of National Guardsmen to help restore order. Democratic Governor Charles L. Terry (a southern-style Democrat) sent in the entire state National Guard and refused to remove them after the rioting was brought under control. Republican Russell W. Peterson defeated Governor Terry, and upon his inauguration in January 1969, Governor Peterson ended the National Guard’s occupation in Wilmington. The 1968 Louisville riots refers to riots in Louisville, Kentucky, in May 1968. As in many other cities around the country, there were unrest and riots partially in response to the assassination. On May 27, 1968, a group of 400 people, mostly blacks, gathered at Twenty-Eight and Greenwood Streets, in the Parkland neighborhood. The intersection, and Parkland in general, had recently become an important location for Louisville's black community, as the local NAACP branch had moved its office there. Within an hour, Mayor Kenneth A. Schmied requested 700 Kentucky National Guard troops and established a city-wide curfew. Violence and vandalism continued to rage the next day, but had subdued somewhat by May 29. Business owners began to return, although troops remained until June 4. Police made 472 arrests related to the riots. Two African-American teenagers had died, and $200,000 in damage had been done. On April 5, at 11:00 AM, Johnson met with an array of leaders in the Cabinet Room. These included Vice President Hubert Humphrey, U.S. Supreme Court Chief Justice Earl Warren, Supreme Court Justice Thurgood Marshall, and federal judge Leon Higginbotham; government officials such as secretary Robert Weaver and D.C. Mayor Walter Washington; legislators Mike Mansfield, Everett Dirksen, William McCulloch; and civil rights leaders Whitney Young, Roy Wilkins, Clarence Mitchell, Dorothy Height, and Walter Fauntroy. Notably absent were representatives of more radical groups such as SNCC and CORE. At the meeting, Mayor Washington asked President Johnson to deploy troops to the District of Columbia. Richard Hatcher, the newly elected black mayor of Gary, Indiana, spoke to the group about white racism and his fears of racially motivated violence in the future. Many of these leaders told Johnson that socially progressive legislation would be the best response to the crisis. The meeting concluded with prayers at the Washington National Cathedral. After the Watts riots in 1965 and the Detroit riot of 1967, the military began preparing heavily for black insurrection. The Pentagon's Army Operations Center thus quickly began its response to the assassination on the night of April 4, directing air force transport planes to prepare for an occupation of Washington, D.C. The army also dispatched undercover agents to gather information. On April 5, Johnson ordered mobilization of the Army and National Guard, particularly for D.C. Some responded to the riots with suggestions for improving the conditions that engendered them. Many White House aides took the opportunity to push their preferred programs for urban improvement. At the same time, some members of Congress criticized Johnson. Senator Richard Russell felt Johnson was not going far enough to suppress the violence. Senator Robert Byrd suggested that Washington, D.C. ought to be occupied indefinitely by the army. Johnson chose to focus his political capital on a fair housing bill proposed by Senator Sam Ervin. He urged Congress to pass the bill, starting with an April 5 letter addressed to the Speaker of the United States House of Representatives, John William McCormack. These events led to the rapid passage of the Civil Rights Act of 1968, Title VIII of which is known as the "Fair Housing Act". President Johnson: [Unclear] . . . Goddammit, I don't know how we handle these things. But I know one thing: that we've got to handle them with muscle and with toughness. And we put troops in every place they asked me to, and we came after it [in] reasonably good shape. The assassinations triggered active unrest in communities that were already discontented. For example, the Memphis Sanitation Strike, which was already underway, took on a new level of urgency. It was to these striking workers that King delivered his final speech, and in Memphis that he was killed. Negotiations on April 16 brought an end to the strike and a promise of better wages. In Oakland, increasing friction between Black Panthers and the police led to the death of Bobby Hutton. For some liberals and civil rights advocates, the riots were a turning point. They increased an already-strong trend toward racial segregation and white flight in America's cities, strengthening racial barriers that looked as though they might weaken. The riots were political fodder for the Republican party, which used fears of black urban crime to garner support for "law and order", especially in the 1968 presidential campaign. The assassination and riots radicalized many, helping to fuel the Black Power movement. ↑ Levy, Peter B. (2011). "The Dream Deferred: The Assassination of Martin Luther King Jr., and the Holy Week Uprisings of 1968". In Jessica I. Elfenbein; Thomas L. Hollowak; Elizabeth M. Nix. Baltimore '68 : riots and rebirth in an American city. Philadelphia: Temple University Press. ISBN 978-1-4399-0662-0. ↑ Dyson, Michael Eric (2008). "Facing Death". April 4, 1968 : Martin Luther King Jr.'s death and how it changed America. New York: Basic Civitas Books. ISBN 978-0-465-00212-2. ↑ Risen, Clay (2009). "April 5: 'Official Disorder on Top of Civil Disorder'". A nation on fire : America in the wake of the King assassination. Hoboken, N.J.: John Wiley & Sons. ISBN 978-0-470-17710-5. There was no 'typical' rioter, but the statistically average profile was better educated and more likely to be employed than most people in the riot area (though, despite claims later made on the Senate floor, only a handful of rioters were government employees). Such results underscore an alternative theory of ghetto rioting: that it was at least as much an expression of protopolitical anger as it was of opportunism and common criminality. ↑ Risen, Clay (2009). "April 4: U and Fourteenth". A nation on fire : America in the wake of the King assassination. Hoboken, N.J.: John Wiley & Sons. ISBN 978-0-470-17710-5. ↑ Risen, Clay (2009). "April 5: 'There are no ghettos in Chicago'". A nation on fire : America in the wake of the King assassination. Hoboken, N.J.: John Wiley & Sons. ISBN 978-0-470-17710-5. 1 2 Rhodes, Joel P. The Voice of Violence: Performative Violence as Protest in the Vietnam Era. Greenwood Publishing Group. p. 21. ISBN 0-275-97055-8. 1 2 Burnes, Brian; Rice, Glenn E. (2007-08-10). "Riots of 1968 were a watershed moment for KC". Kansas City Star. Archived from the original on 2008-04-09. Retrieved 2008-04-12. ↑ "Kansas City riots, April 1968". Kansas City Star. January 16, 2006. Retrieved 2008-04-12. ↑ https://news.google.com/newspapers?nid=8_tS2Vw13FcC&dat=19680406&printsec=frontpage&hl=en "10 Dead As Violence Continues In Major U.S. Cities; Troops Sent To Washington, Chicago, Detroit" Toledo Blade, April 5, 1968. ↑ https://news.google.com/newspapers?nid=SAguW2jnL4UC&dat=19680405&printsec=frontpage&hl=en "Ghettoes react to King's death" The Windsor Star, April 5, 1968. ↑ Jennifer Alice Delton, Racial Integration in Corporate America, 1940–1990 p. 262. ↑ Williams, Kenneth H. (1988). "Oh…It's Really Happening:" The Louisville Race Riot of 1968". Kentucky History Journal. 3: 57–58. ↑ Louisville Survey:West Report. pp. 37–38. ↑ Risen, Clay (April 2008). "The Unmaking of the President: Lyndon Johnson believed that his withdrawal from the 1968 presidential campaign would free him to solidify his legacy". Smithsonian Magazine. Retrieved 18 July 2012. 1 2 3 Kotz, Nick (2005). "14. Another Martyr". Judgment days : Lyndon Baines Johnson, Martin Luther King Jr., and the laws that changed America. Boston: Houghton Mifflin. p. 417. ISBN 0-618-08825-3. ↑ Risen, Clay (2009). "April 5: Midnight Interlude". A nation on fire : America in the wake of the King assassination. Hoboken, N.J.: John Wiley & Sons. ISBN 978-0-470-17710-5. ↑ "Civil rights during the Johnson administration". LBJ Library. Retrieved 18 July 2012. 1 2 3 Risen, Clay (2009). A nation on fire : America in the wake of the King assassination. Hoboken, N.J.: John Wiley & Sons. ISBN 978-0-470-17710-5. ↑ Johnson, Lyndon Baines (5 April 1968). "182 – Letter to the Speaker of the House Urging Enactment of the Fair Housing Bill". American Presidency Project. Retrieved 19 July 2012. We should pass the Fair Housing law when the Congress convenes next week. ↑ Presidential Recordings Program. "WH6804-01-12910". Johnson Tapes Transcripts. Retrieved 18 July 2012. ↑ Jacob, Mark (30 March 2010). "Recordings show Daley, LBJ worked to stem 1968 riots: President scolded mayor for not asking for help sooner". Chicago Tribune. Retrieved 18 July 2012. ↑ Presidential Recordings Program. "WH6804-01-12919". Johnson Tapes Transcripts. Retrieved 18 July 2012. ↑ "Memphis Sanitation Workers Strike (1968)". King Institute Encyclopedia. Martin Luther King Jr., Research and Education Institute. Retrieved 18 July 2012. ↑ Michael Garofalo; Selly Thiam; Steven Thrasher (4 April 2008). "Sanitation Workers Remember King's Last Stand". NPR. Retrieved 18 July 2012. ↑ Koch, Kathleen (4 April 1998). "Nation's capital still recovering from 1968 riots". CNN. Retrieved 18 July 2012. ↑ "MARTIN LUTHER KING JR ASSASSINATION". History.com. Retrieved April 6, 2016.